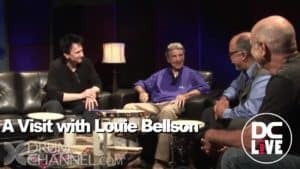 Duke Ellington called him "the world's greatest drummer," and that he was...member of the "Big Three": Louie Bellson - Gene Krupa - Buddy Rich. He was a composer, arranger, bandleader, tireless jazz educator, pioneered the use of two bass drums, and in terms of the speed of his hands and feet and the wonderful, percussive "ideas" he conveys on the drums, stands next to only Buddy Rich as the total technician. He has performed and/or recorded with Duke Ellington, Count Basie, Benny Goodman, Tommy Dorsey, Harry James, Woody Herman, Benny Carter, Sarah Vaughan, Ella Fitzgerald, Oscar Peterson, Art Tatum, Dizzy Gillespie, Gerry Mulligan, Stan Getz, Hank Jones, Sonny Stitt, Milt Jackson, Clark Terry, Louie Armstrong, Lionel Hampton and many more.